'I hope to show that understanding a little about time in modern physics helps us more deeply appreciate some of the most profound ideas in Buddhism. Furthermore, I will also suggest that some appreciation of Middle Way Buddhist ideas could aid in the development of physics. Thus a nontrivial synergy between these two very different disciplines is possible, one that results in deeper understanding and more compassionate action. While time may be a devouring tiger, appreciating these ideas might help us attain equanimity and encourage us to act more compassionately toward each other and the planet...."
"I’ll review the principle of emptiness within the Middle Way Consequence School (Prasangika Madhyamika, which I abbreviate by Middle Way) through a little story. Nearly thirty years ago a very holy man gave me some fresh carrot juice to drink. What a tasty elixir! I returned home determined to grow some fresh carrots of my own on our little farm. (Actually, I was determined to get my wife to grow them.) However, the soil in my part of the world is heavy and stony, and the carrots that first year were stubby and misshapen. I thought, "If only I had a garden tiller, I could whip that heavy soil into the most beautiful carrot bed." I could not afford one of those fancy tillers that a delicate ten-year-old girl can operate with one hand. My rototiller is a test of my manhood, a bucking bronco requiring strength and stamina. Of course, time destroys both people and equipment, and my tiller soon suffered from a long list of woes. It requires the patience of an advanced Bodhisattva to start, it only works at the deepest setting, it no longer has a reverse, and it cannot run in place and so bolts ahead . . . when you can manage to start it. However, I only use it a few hours a year, so I suffer with it and consider it a perverse sort of challenge. Since it is so critical to identify inherent existence carefully, let me say it in other words. Consider the carrot stripped of its sense qualities, history, location, and relation to its surroundings. All but an advanced practitioner of the Middle Way believes that this denuded carrot has some unique essence, some concrete existence that provides the foundation for all its other qualities. This core of its being, this independent or inherent existence, is what the Middle Way denies. The carrot surely has conventional existence; it attracts rodents and makes great juice. It functions as a food. However, it totally lacks independent or inherent existence, what we falsely believe is the core of its being. In other words, the object or subject we falsely believe independently exists is not actually "finable upon analysis." When we search diligently for that entity we believe inherently exists, we cannot actually find it. It’s independent being does not become clearer and more definite upon searching. Instead, phenomena exist in the middle way because they lack inherent existence, but do have conventional existence. According to the Middle Way, we can put out the fire by deeply appreciating the doctrine of emptiness, the lack of inherent existence in all subjects and objects, in all phenomena. This requires not only an intellectual formulation as given here, but a profound transformation of our whole being at many levels—a process that usually takes many life times..."
The description of emptiness given so far is negative, a thoroughgoing denial of what we wrongly believe is the core of existence. Next, let me turn to a more positive description of phenomena, including carrots. If phenomena don’t independently exist than how do they exist? The Middle Way tells us that they dependently exist in three fundamental ways. First, phenomena exist dependent upon causes and conditions. 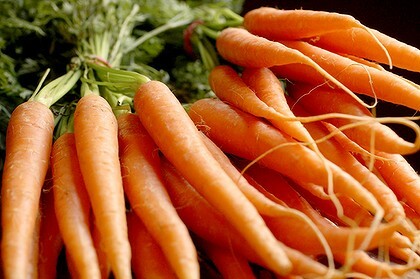 For example, carrots depend upon soil, sunlight, moisture, freedom from rodents, and so forth. Second, phenomena depend upon the whole and its parts. Carrots depend upon its greens, stem, root hairs, and so on and the totality of all these parts. Third, and most profoundly, phenomena depend upon mental imputation, attribution, or designation. From the rich panoply of experience, I collect the sense qualities, personal associations, and psychological reactions to carrots together, and name them or designate them as "carrot." The mind’s proper functioning is to construct its world, the only world we can know. The error enters because along with naming comes the false attribution of inherent existence, that foundation for desire and aversion. Critics of the Middle Way often say that if objects did not inherently exist, they could not function to produce help and harm. Carrots lacking independent existence could not give sweet juice or make soup. The Middle Way turns this around 180 degrees, and answers that it is precisely because objects and subjects lack independent existence that they are capable of functioning. So the very attribute that we falsely believe is at the core of phenomena would, if present, actually prevent them from functioning. Now how does all this relate to the Middle Way notion of time? As I mentioned above, if phenomena inherently existed then they would of necessity be immutable and impotent, unable to act on us or we on them. Since, in truth, phenomena are fundamentally a shifting set of dependency relations, impermanence and change are built into them at the most fundamental level. That the carrot exists in dependence upon causes and conditions, its whole and parts, and on our attribution or naming is what makes it edible, allows me to experience it and be nourished by it. More important for impermanence, these defining relations and co-dependencies and their continuously shifting connections with each other guarantee that all objects and subjects are impermanent, ceaselessly evolving, maturing, and decaying. In short, emptiness and impermanence are two sides of the coin of existence and therefore transformation and change are built into the core of all entities, both subjective and objective. In this way, the doctrine of impermanence is a direct expression of emptiness/dependent arising. Because I lack inherent existence and am most fundamentally a kinetic set of shifting experiences, with no eternal soul, as we normally understand it, then "Time is the substance I am made of." Borges’ compact sentence seems like a Middle Way aphorism. Being substantially of time guarantees my continuous transformation and death. Indeed, time "is a fire that consumes me, but I am the fire." These philosophic truths of emptiness and impermanence are central to Buddhist practice, and I return to them later. Now let us turn to physics and its view of time.